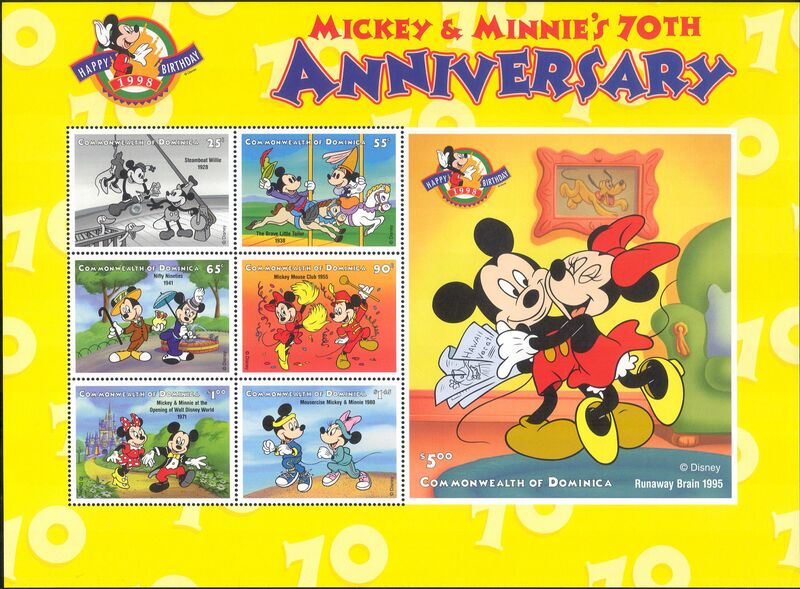 Commonwealth of Dominica 1998 Mickey Mouse's 70th Birthday 7 value sheet featuriug Mickey and Minnie in scenes from the Films "Steamboat Willie" (1928), "The Brave Little Tailor" (1938), "Nifty Nineties" (1941), "Mickey Mouse Club" (1955), "At Walt Disney World" (1971), "Mousercise" (1980) and "The Runaway Brain" (1995) - in superb u/m (mnh) condition - excellent country, Disney, animation, cartoons, films, cinema, anniversary thematics. If you cannot find the specific stamp set or thematic/topic you are looking for either here in my shop or at the brumstamp stamp shop on eBay http://stores.shop.ebay.co.uk/The-Brumstamp-Stamp-Shop please do not hesitate to contact me. Enjoy browsing and shopping. Andrea!